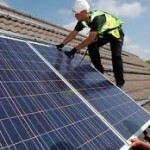 Tips for renewable energy at home – When it comes to renewable energy systems for your home there are several alternative options depending on the specific circumstances of your location and physical features, environmental – climatic conditions and physical characteristics of the location – building. Residential energy systems include home solar panels, or residential wind turbines or geothermal systems etc. Perhaps the most popular systems of all are home solar panels due to their efficiency, wide range of applications and cost effectiveness. Residential solar energy systems can be used for heating, generation of electricity or for providing solar lighting. For more remote or open space, locations with adequate wind resource, you can install a small residential type wind turbine to generate your own electricity. Wind energy systems can be also used to charge a mobile battery of for pumping water etc. 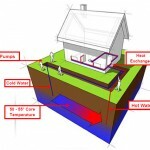 Another renewable energy source for residential application is geothermal energy. Geothermal energy systems are based on the principle of a constant, desirable, temperature found at a distance underground which can be used to heat, in winter, or cool, in summer, the internal temperature of our home. With the use of a heat-pump and a heat exchanger system it is possible to save energy by using the constant temperature of the earth as a heat or cooling source in order to moderate internal house temperature to the desired temperature level. You can visualise the use of geothermal energy with the following illustrative example: If the ‘geothermal’ energy is translated as a source of constant temperature between 19-22 dec Celsius (temperature of earth at a depth 30-70 feet underground) and the desired temperature level of our house interior is between 24-26 Dec C., then this temperature sink can be used for space cooling in summer, where temperatures may reach 30-40 dec Celsius. Similarly, it can be used for space heating in winter where temperatures may fall well below 18 deg.C. Cost savings from using geothermal energy are achieved because by using the energy potential of earth (constant temperature near our desired temperature level) we avoid consumption of energy for heating and cooling such as operating an electrical heater or an electric air conditioner. In general, renewable energy technologies and systems can be used not only to save the environment, as green technologies, but also as energy saving solutions at home. Below is a list of renewable energy tips and energy saving tips at home. Make use of inexpensive and easy to use renewable energy applications such as solar lighting devices for internal or outdoor lighting; solar lights can be used all year round or occasionally for special applications such as providing for solar lighting at Christmas period. 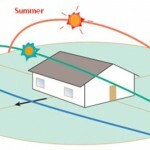 If you are planning to build your home, make sure you consider some basic bio-climatic principles in designing and orienting your house; simple bioclimatic solutions and solar heating and cooling principles can be highly beneficial and cost-effective by reducing the energy needs of your home for all the years to come. Proper orientation of your house openings (South-facing windows) coupled with properly designed natural or featured shading solutions and proper building insulation can greatly reduce energy needs for cooling in summer and energy needs for heating in winter. The end result will be an increased energy efficiency of your home and a substantial reduction in your energy bill especially if considered on an annual basis. Make sure you make good use of solar water heating; depending on the sophistication and complexity of your house facilities you can make extensive use of solar water heating and increase cost-savings on your bills. Starting from basic solar heaters for hot water you can incorporate solar heated water to other energy systems of your home as an auxiliary energy solution – such as integrated solar heater to an existing space heating system – e.g. using solar hot water in a closed under floor heating circuit. 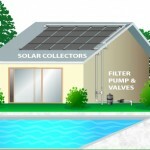 Extended applications of solar hot water include heating of a swimming pool. Residential solar power is a must for contemporary buildings; there are many different types of home solar power systems that can be used and provide cost savings on the home energy budget. Residential solar power systems are highly efficient and highly beneficial for both the environment and economically; home solar energy systems are used to heat water, provide electricity, offload a heating system or provide solar light. Solar water heating is definitely the most cost-effective use of home solar power; solar water heating can be used to provide hot water for home use, hot water for space heating or for other hot water uses such as heating of a swimming pool or a home spa facility. Renewable energy for home does not necessarily mean installation of renewable energy systems at home, such as residential solar panels or wind a turbine. An alternative way is to buy, from a utility company, renewable electricity; electricity produced from renewable energy sources such as solar energy, wind energy, geothermal energy or bio fuel. Apart from increasing the energy efficiency of you home using passive means, such as bioclimatic design, passive solar systems, proper building insulation and increasing the energy efficiency of your home, you can consider ‘active’ energy solutions such as solar panels to generate your own electricity. Solar panels have become extremely popular especially for residential applications (home solar panels) due to the drastic reduction in solar panels cost. Solar panels are easy to install on roof (roof mounted solar panels) or on land (land-mounted solar panels). However, before deciding to proceed on residential solar panels you should consider some basic – important factors. Though such a decision is best dealt by consulting a solar panel professional, you should be aware of some related issues such as, the solar energy potential of your location, solar radiation levels and climatic conditions of your location. Also, a shade-free environment with a south-facing orientation of solar windows can adequately justify the installation of home solar panels. Additional issues relating to a decision for residential solar power systems relate to the existence of green power financial incentives in your area for installation of solar panels; different programs exist ranging from subsidy funding via FIT (feed in Tariffs) to initial investment subsidy aids, tax credits, utility rebates etc. Also, the type of solar panel installation that is feasible or more appropriate to your custom circumstances (e.g. connected to the utility grid vs. stand-alone) is another factor affecting your final decision and final solar panel system specifications (sizing of home solar panels).